This is the interior of the control room, from the conn or periscope stand looking toward the starboard side. This row of consoles is called the attack center. 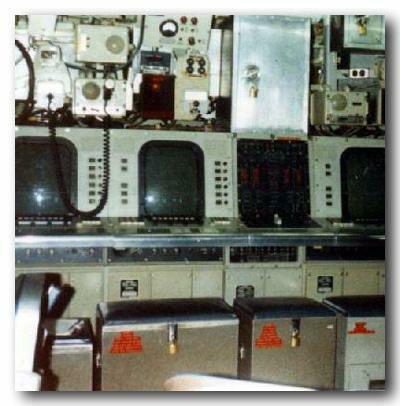 These are the Mark 117 firecontrol consoles, replaced the next year by the Mark I system. They all work similarly to the present systems. To the left is Pos One, where the battlestations officer displays a God's-eye-view of the sea for the captain, with own-ship in screen center and the calculated positions of the enemies or contacts arrayed around own-ship. Right of Pos One is Pos Two, my battlestation, where the battlestations officer plays the computer game called Stack the Dots to determine the solution (range, speed and course of the enemy) by dialing in assumed solutions and seeing how the calculated bearing to the target matches the actual measured bearing. By driving the ship left and right across the line-of-sight to the target using only passive listen-only sonar for stealth, a parallax range can be made, and the computer program will stack the dots neatly into a vertical line (each dot is a FIDU, fixed interval data unit, a combination of sonar data taken over 15 - 20 seconds). If the dots form a Z, you haven't got a solution. If the dots stack vertically and the new dots arriving on top continue to keep the line vertical, you have a "firing solution," something close enough that you can shoot a torpedo - not at the target, but at a point in space where the target will be in the future at the exact moment the torpedo occupies that same space. It is exactly like throwing a football at a running wide receiver. But if the newly arriving FIDU dots start diverging off making the dot stack lean over, the target just "zigged," or made a maneuver, so that the FIDU doesn't match the computer's calculation of where the assumed solution shows him being. The Pos Two operator calls, "Possible target zig!" and the battlestations team does a number of immediate actions. To the right of Pos Two is the firing panel showing torpedo tube settings, with the large trigger on the horizontal part of the console. Pos Three is to the right, where the weapons are programmed, told what their settings are, target mode, speed to intercept, etc. The firing panel may be manned by a firecontrol technician or by the weapons officer manning Pos Three. When it's time to shoot, the captain calls "Firing point procedures, Master One, tube one." The officer of the deck reports, "ship ready." The weapons officer at Post Three and the firing panel reports "Weapon ready." The Pos Two operator declares "solution ready." The captain orders the torpedo fired by saying, "shoot on generated bearing." The Pos Two operator calls, "set," locking the solution into the firecontrol system. The firing panel operator and Pos Three operator (weapons officer) takes the trigger to the left, the STAND-BY position and calls,"Stand-by." The captain then orders, "shoot," and the weapons officer takes the trigger to the 3 o'clock position, the FIRE position, and shouts, "Fire!" The room erupts in an earsplitting BOOM as the high pressure air that shoved the firing ram forward in the torpedo room to pressurize the water in the water-round-torpedo tanks vents inboard, slamming the ears of the crew. The weapons officer declares, "tube one fired electrically." Sonar calls, "own-ship's unit, normal launch." Makes me long to go back to sea.